Harrogate Town were dumped out of the West Riding County Cup by lower league Garforth Town at the CNG Stadium on Tuesday night. The lively Mark Simpson shocked the home faithful four minutes into the second half after latching on to a loose Rhys Meynell pass across defence for a simple finish. A blunder from Phil Barnes five minutes put the game out of Town’s reach after a speculative 25 yard effort from Tawanda Rupereke squirmed under the goalkeeper’s grasp. 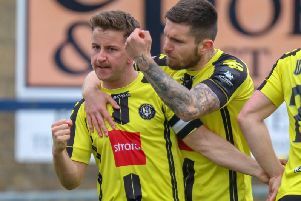 Ashley Worsfold’s long awaited return from injury for the final 20 minutes gave the home fans something to cheer about in an otherwise disappointing evening. Simon Weaver named a strong side for the clash which included Rhys Meynell, James Walshaw and Lloyd Kerry and it was the Conference North side that started the brighter of the two teams. Dominic Rowe was unfortunate not to give Weaver’s men the early lead after latching on to a long ball forward from Meynell but Garforth stopper Ben Hunter was equal to the shot. After the early scare, Garforth settled their nerves and eased into the game as Jay Davies tested Barnes’ reflexes, forcing him into a save from a 35-yard effort. Kerry was proving a bright spark for Weaver’s side in a game that was lacking any real quality and was unfortunate not to open the scoring from a free kick on the edge of the area. The midfielder was brought down after brilliantly intercepting the ball and his curling effort looked set for the top corner, until Hunter clawed it clear. Town couldn’t turn their early chances into goals and were almost made to pay as a mistake from Adam Nowakowski allowed Rupereke to send a shot trickling agonisingly across the goal line. A driven 30 yard effort from Garforth’s Simpson forced a smart save from Barnes before Nowakowski’s dipping half-volley was tipped over from Hunter in the best chance of the first half. Weaver’s side never got into their second half stride and were duly punished as Simpson intercepted a woeful square ball from Meynell to put the lower league side ahead after 49 minutes. Nowakowski went close to drawing the sides level as he was quickest to react from a corner, but his goal-bound effort was cleared off the line. Garforth looked good value for their lead though and doubled their advantage on the hour as Rupereke’s long-range effort found the net, leaving Barnes red-faced. Moments later and another calamitous defensive mix-up between Barnes and Franks almost gifted the on-rushing Simpson a second but the ‘keeper scrambled back to save further embarrassment. Fans were left with one reason to be cheerful in an otherwise abject evening as Worsfold replaced Kerry midway through the second half. But it was the visitors who stole the show as Town missed out on their last realistic chance for silverware this season.